What is an Oxgygen Bar? 3 Monkeys Inflatable provides a free standing bar which participants can stand or sit (whichever makes them most comfortable). They will breather 90% pure oxygen and aromotherapy from a disposable nasal cannula (nose hose). The bar can serve up to 6 people at a time and manned by one technician also knows as "oxy-barastas." The oxygen is not kept under pressure nor is it administred from a tank. Our oxygen is produced by oxgygen concentrators (generators) which take the ambient air that we breathe everyday and sperates the nitrogen from this ambient air with a molecular filter. Most of the nitrogen is expelled during this cyle and the oxygen is concentrated and pushed out of the machine through a tube which is attached to the Aromarizer, which sits on top of the bar. The bartender/technician controls the flow of the oxygen to to the individual bottle that hold water and the all natural essential therapeutic-grade aromas. In turn the bottles bubble when turned on and oxgygen is forced into the bottle which has another open ended tube on it. Nasale Annulas are connected to that tube while the user breathes normally. Please note: Oxygen is a very dry gas and needs to be humidified and this is one of the two reasons why it is passed through the water. The other reason is to have it pick up the pleasant scent. These are great for Corporate Events and Student Life at College/Universities. 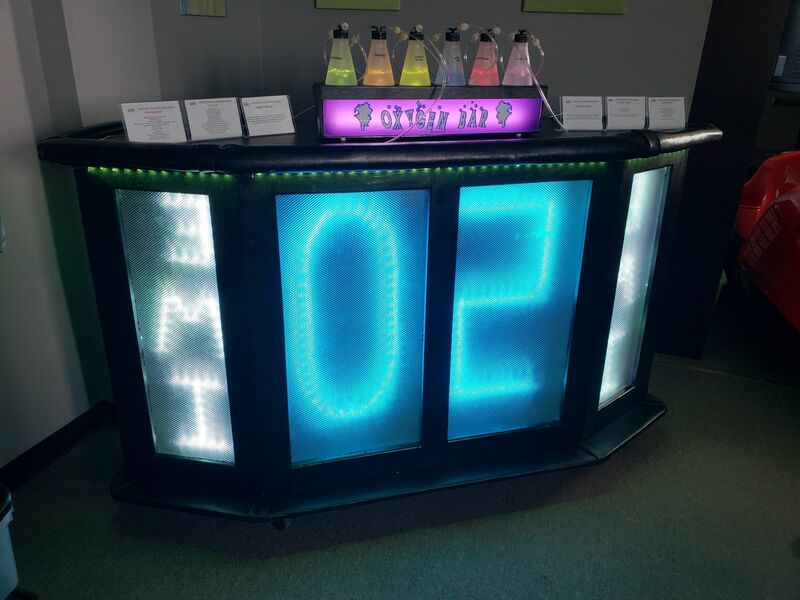 This is a innovative way to keep staff/students engaged socially and academically. 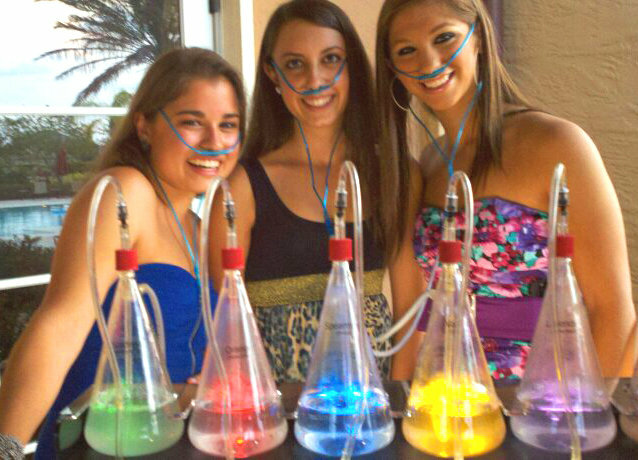 Colleges, Universities, High School and Corporations are now using Oxygen bars to help relieve stress, and create an overall increase in health and stress free wellness. Think about exam weeks, stressful deadlines, everyday stresses that are occurring in students and co workers lives. Students/Staff line up for the relaxing and stress reducing effects by breathing oxygen with the added benefit of aromathereapy through the use of all-natural and organic essential oils. We have up to 6 scents per day/session that are offered to choose from. Lavender and Vanilla add to an already calming effects of oxygen, while other scents such as eucalyptus and peppermint will engergize students/staff looking to be "on top of their game" studying, focusing on a big project or just allowing them to de-stress and re-group. A social environment where students and staff can interact with their peers/co-workers.